“Conjunction junction, what’s my function?” Anybody remember that catchy Schoolhouse Rock Song? That’s not what this post is about but wouldn’t it be cool if someone made a catchy song about the manipulation junk that toxic people pull on those around them so their tactics would be easy to remember? Recently, I found an article about some key manipulation tactics that are good to be aware of. I encourage you to check out the whole article but here are the highlights. Monitoring – when the toxic person wants to be in constant contact. It’s kind of low level stalking. Watch out, when you are slow to respond, if you get an angry reaction. Object constancy – on the positive side, this is the ability to still love the person you are annoyed with. A toxic person tends to lack this so when they rage, they lose their affection. Think Jekyll and Hyde. Watch out if you find yourself modifying your words and behaviours to avoid the rages. Flipping the script – this is when a toxic person tries to continuously wind you up. In the process they may accuse you of the things they themselves do. The point is to confuse and make their victim emotional. Perspecticide – think gaslighting+. “When the manipulative person has made someone believe so many things that aren’t true, they no longer know what is real.” Watch out if you are compromising your boundaries, your values, faith or family to appease the toxic person. Believe it or not, I used to be a competitive swimmer. I did it for about 2 years. I got my picture in the paper which was cool. I swam a 2 hour, 200 length (5000m), swim-a-thon for some charity and then discovered that people who sponsor kids for events don’t like to pay said kids post event. But I peaked around 10 years of age and moved on to other things, like sleeping in because I didn’t have to go to the pool at 6am. It’s about priorities. Anyway, one day after swim club, I was in the changing room and a man with a disability approached me. He was difficult to understand but he seemed friendly. He stuck out his hand for what I thought was a handshake. I went to shake his hand and he proceeded to grab my hand and then he started to undo his pants. I was frozen – shocked by what was happening – and then he put my hand on his crotch. The incident ended in moments. I pulled my hand away, grabbed my stuff and headed for the door. My mom was waiting for me. I told her what happened. She told the staff who promptly took action. I’m grateful for my mom who I could talk to. I’m grateful that I didn’t have to keep it secret due to fear of that man or even fear or shame from my parents. Even so, I don’t talk about it. This is the first time I’ve written about it. When I remember it, I still feel that sense of being trapped and powerless, I still feel my own shame. I decided to take this journey into my past and to share it here because it has become crystal clear to me that when we are hurt like this (and I recognize my experience was really minor compared to most), silence and shame are just as harmful as the initial abuse. They feed it, let the past hold us captive, prevent us from healing. I would never say one who has been hurt must speak about it. Each person should be in charge of their own healing journey. I would say, don’t let silence hurt you more than already have been. I also want you to know I’m listening and I believe you. I’m a hugger. Been that way for a long time. I’m told I’m good at it (aka encouraging and comforting but not creepy). I always ask. I find non-huggers and side-huggers (side hugs are from satan) to be weirdos. One guy would run out of the room whenever I brought up the subject in our group. Even so, I respect that people have their own ways and so I don’t make a big deal about it. The other day, a friend sent me this article: How a Lack of Touch is Destroying Men. I was immediately intrigued. From a mental health perspective, I think the author has something important to say because he relates it to isolation. I encourage you to check it out but here’s a little excerpt and then a deep thought. “In American culture, we believe that men can never be entirely trusted in the realm of the physical… Accordingly, it has become every man’s job to prove they can be trusted, in each and every interaction, day by day and case by case… by foregoing physical touch completely in any context in which even the slightest doubt about our intentions might arise. One of the powerful experiences that the Bible communicates is that Jesus touched people. Sadly, he is often presented stoically, distance, and unapproachable. In The Gospel of Matthew by The Visual Bible, Jesus is portrayed warm and friendly – I believe it’s the most accurate and realistic movie version of Jesus. In the Good News, there is one time when a leper comes to Jesus and asks if he is willing to heal him. Keep in mind that this person would not have been touched or even treated humanely for a long time. But Jesus is more than willing and he touches the man! To me, this is Jesus not just healing the physical ailment but the heart. How about you? What role does touch play in your life? Have you figured out touch or are you in isolation? This isn’t a definitive article on this condition. I honestly don’t know lots about it. I can say that it’s often misunderstood due to TV and movies that suggest it’s just a fear of being outside or around people. Basically, a person can experience this at any place or area, even one’s own home. 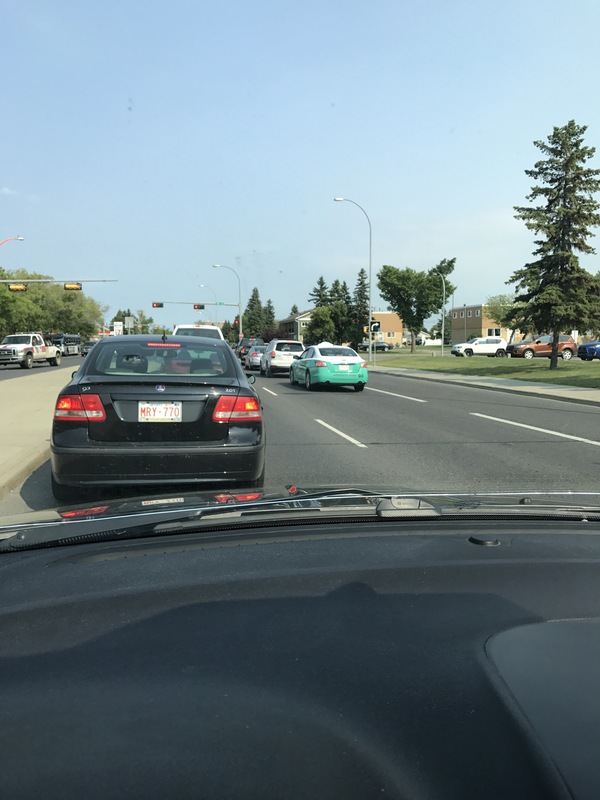 This is 87 Avenue, just east of 170 Street in Edmonton, Alberta. Up until a few weeks ago, we lived in this area. Due to a journey we took with a wonderful young person, I had a full on encounter with a psychologically abusive person who came after me. It wasn’t the fault of the person we welcomed into our life but it was related to that time. The person that came after me, lives in the area off to the right. After we moved, we came back a few days later to do one last check for mail (just in case anything got missed by the post office forward). As we crossed over 170 Street, my heart was gripped with anxiety. My heart rate shot up and I just had this sense of fear. This wasn’t the first time I had this experience in this area, it’s happened most every day when passing this area and don’t get me started on what it’s like to walk here rather than drive) but it was the first time it hit me – I had developed a mild agoraphobia. My hope is, over time and not being in the area for a long time, I will have healing and be free from that person’s impact on me. Sadly, this is a very real experience and one that hits home to me for two reasons. In the past, I saw this kind of thing and didn’t know what was happening. I regret not having the knowledge and the backbone to make a difference in those situations. It also hits home, because one of these people got me in just the way Shannon Thomas describes. While I was taken aback by the shock of it all, the part that hurt, still hurts, is how people I counted as friends so easily turned to the negative. One co-worker called me shortly after the major attack, revealing that he had been “filled in on the story” just before the meeting and suggested I “just apologize” to the accuser. My flying monkey alarm bells went off big time. I now keep safe distance from that co-worker. The worst part is, he is a key leader in the church and I am concerned that his willingness to be a flying monkey will harm those to whom he ministers. I encourage you to check out Shannon Thomas’ book, “Healing from Hidden Abuse: A Journey Through the Stages of Recovery from Psychological Abuse.” Her book is available as paperback, Kindle, and audiobook. Remember that not everyone who is a jerk is a narcissist, sociopath, or psychopath. If we’re honest, we’ve all done things we’re not proud of. However, if you have a person in your life who demonstrates repeated narcistic-like behaviours without genuine remorse (on my blog do a search for “Diversion Tactics), then you need to be very careful, establish boundaries, and perhaps seek professional assistance. He goes on to note that we are trying to run away from pain by numbing ourselves but the answer is to be with the pain. The thing is, we can only be in the pain when we are surrounded by compassion. From a faith perspective this is so powerful because Jesus is truly empathetic having known and borne our pain and he is also compassion incarnate. Please take a few minutes and hear what he has to say. It could change your life or the life of someone you love. Do spend any time around children? They tend to be little balls of energy that can explode at any moment. I think adults are the same but usually low key. In my experience, yelling at children to calm down doesn’t work very well – go figure. Recently I stumbled upon this article: 50 calm-down ideas to try with kids of all ages. Our children are adults now but we do have three grand babies and I am testing these ideas out on them. The upside is, if they fail horribly, I just get to go home and let mom figure it out. Actually, I haven’t tried or even seriously reviewed all of the ideas but a few jumped out to me. If you’re willing and able, maybe give some a try and let me know how it goes. Drink water – Pour a tall class of cold water and sip it slowly. Sing out loud – I found this works but only until the GBs starting fighting over which song to play. The trick is to find a song they all like to sing. Jump high – I don’t know if this is calming but it can sure be distracting – sometimes beggars can’t be choosers. Take a cold shower – I haven’t done this with the GBs but in one of my least proud parenting moments, once when our daughter was having a melt down, I put her in the shower and turned on the cold water. I don’t remember it calming her down. Watch fish – We don’t have fish but getting the GBs to focus on creatures does seem to calm them. Talk it out – I use this one with our oldest GB as he can talk about what he’s feeling. Most of the time, it seems he becomes upset because he’s feeling unheard. Check out the article and let me know what happens. If you’re trying to be healthy, it’s likely you have been told or have figured out your BMI or Body Mass Index. BMI is calculated by taking a person’s weight in kilograms (kg) divided by his or her height in meters squared. For those of you in the USA, I realize you’re probably thinking kilo-whats?? Sorry for going metric on you but that’s just way it is. If you’ve been looking at your BMI and beating yourself up you need to know that it doesn’t tell you anything real about yourself. Should you consider a healthier more active lifestyle? Maybe. Maybe you’re okay as you are right now. The point is, don’t let your BMI mess with your head. Check out this short video on the truth about BMI.